Flooring Dusky is a premium Magento theme that can be used for online stores showcasing and selling decors, tiles, carpets, panels etc. The theme would also adapt to different browsing resolutions such as smartphones and tablets apart from normal desktop viewing resolutions. An attractive boxed layout, along with an integrated homepage slider and a magnification scroller for product images help your users easily browse through your featured collections. The theme is compatible with Magento community edition 1.5 and higher and is cross-browser compatible. The theme is set in a glossy black color scheme and comes with a Theme Switcher that can adapt the design to all sizes of display resolutions such as from tablets, smartphones apart from normal desktops. The spacious layout along with a matching color scheme allows you to easily showcase all your product categories in the menu, featured images in the image scroller and a grid for your latest products. One advantage of using a custom theme is that you just need to add your own data in to the default layout, and can also change the design scheme as per your requirement. One important factor while choosing an Magento theme for an online storefront is to have a user-friendly navigation scheme so that your users get to know all about your products and can also easily locate a specific product. The theme has a primary multi-level header menu, along with separate menu locations in the top header and footer. Internal pages can also include sidebar groupings so that you can have a custom link for all carpets priced less then $100 per meter(Example) . A handy keyword search box in the header, along with an advanced search mechanism helps users search for a product by using multiple attributes. Internal product pages come with a magnification scroller so that your users can adjust the scroller to see a magnified version of the product image on screen. The theme also supports multiple product images and also allows users to post a review on the product. Users can also compare between multiple products and can add tags. 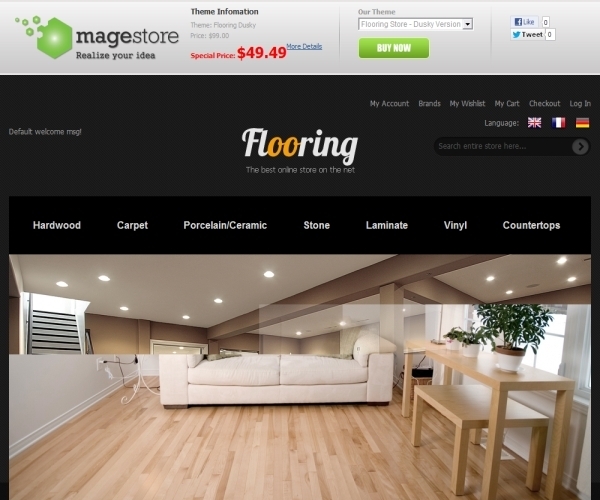 The “Flooring Dusky” premium Magento theme is priced at $49.49.